What is the difference between gasket number 3440 and 9882? Fill out this Google Form with your information. Then email up to 3 photos as attachments to kenneth@redhillgeneralstore.com. Search largest inventory of factory new pressure cooker / canner parts by model number. How (and why) do I find my model number? explain Presto's 409a UL stamp. To guarantee replacement parts properly fit, they should be ordered according to the cooker or canner's model number. 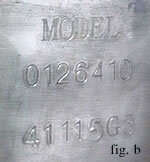 Model numbers are regularly stamped into the metal cooker/canner body like under the handle, on the bottom, or on the cover. If the numbers are too worn and hard to read try making a pencil scratching over the area on white paper. You will also be successful if you have the part number from the manufacturer instruction manual. Mirro: The month and year your cooker was made, if it's stamped into the metal, will appear as a fraction (see figure a). 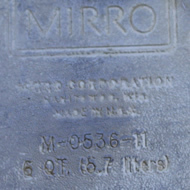 Not all mirro cooker and canners have dates stamped onto their body (slightly to the left of the center on the bottom of the pot). Generally, most model numbers are stamped right into the middle on the bottom of the pressure pot. 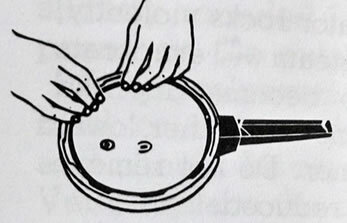 Presto: Some models (the newer, the more likely to) have their number stamped onto the side of the cooker or canner (see figure b). It could also be etched into the bottom or just underneath the handle. Old models will have a label that will be attached to the top of the cover. Older units have model numbers such as 603, 204, 50, 40, etc. 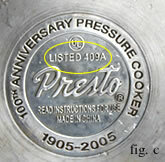 Most Presto cookers and canners will also have a 409a stamped into the bottom of the pot (in the center). This is not the model number. 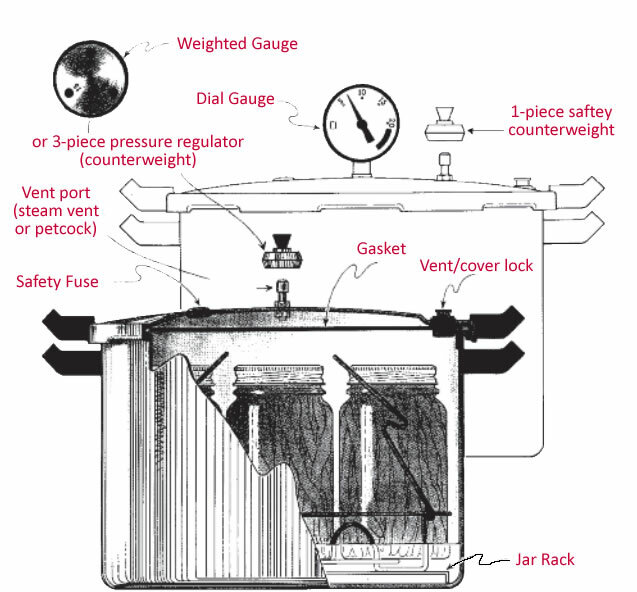 409a notes that this Presto pressure canner or cooker was built and meets the listed Underwriters Laboratory (UL) standards for safe household pressure cooking and canning (These requirements cover household-type cooking utensils known as pressure cookers or pressure sauce pans which operate at a nominal pressure of 15 psi (103 kPa) or less. They are intended for use over gas- or electric-top burners of residential type cooking ranges.). 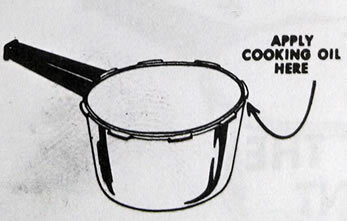 All American Canners and Cookers: The model number is printed on the top of the pot. The last two numbers on the bottom of the pot generally indicate the model too. All American Sterilizers: The model number on electric units appears above the heat control knob (fig e). 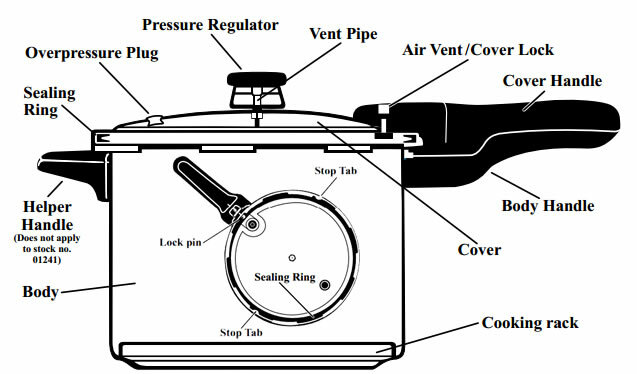 A Rubber Gasket fits into the cover of a pressure canner or cooker to create a secure pressurized seal during cooking. Over time heat exposure can contribute to the sealing ring deformation and shrinkage (and on presto cookers, the automatic air vent may become hard and deformed). When this happens, replace both the sealing ring and automatic air vent (Mirro and All American do not feature an automatic air vent). Anytime you order any of the presto sealing rings, you will receive the automatic air vent in the box. Sealing rings are manufactured to arrive up to 1" too large to be resilient to normal shrinkage. Soaking your gasket in warm water for 10 minutes before installing it can increase pliability. 1 Turn Cover upside down and remove the old ring. Scrub the sealing ring groove in the lid thoroughly with a brush to eliminate all foreign matter. Lay the new ring loosely on the inside of the cover and insert a small section into the sealing ring groove. 2 As you pick up the next section of ring, push it toward the portion just inserted, while at the same time pressing it firmly into the groove. The sealing ring must be squeezed together section by section as you insert the made slightly oversized ring. Work your fingers all the way around the inside edge of the sealing ring to be sure it is fully in place. 3 When putting the cover on the body, press one hand down on the area opposite the handle to help compress the ring. 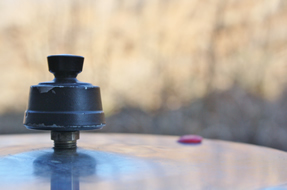 If necessary, to help make the cover easier to open and close, a very light coating of cooking oil may be applied to the underside of the body lug. Pressure Canner gauges should be tested once a year especially when canning at higher altitudes. You can have your gauge tested at a local extension office or at Red Hill General Store's Hillsville, VA Retail location. Demonstration of gauge being tested. Replacing your gauge can be easily done using an adjustable wrench. 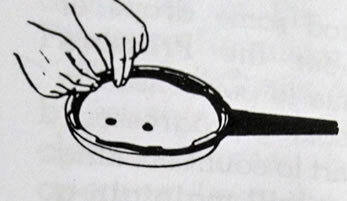 Handle canner and cooker lid gaskets carefully and clean them according to manufacturer directions. Nicked or dried gaskets will allow steam leaks during pressurization. After each use, remove the gasket and wash it in warm, sudsy water. Rinse, dry, and replace the gasket in the lid. Gaskets on older models may require a light coating of veggie oil once per year. Gaskets on newer models come pre-lubricated and do not need oiling. Be sure the petcock, vents and weights are clean. 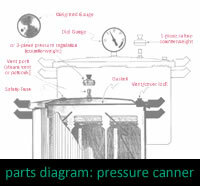 Cool your pressure cooker and canner according to your model instruction manual and the recipe's directions. Take off removable weights (and petcocks for the older models) and wash and dry them by hand. Is the toggle switch (control value / petcock) on old All American Canner replaceable? Yes you can exchange the toggle switch with the new vent tube and regulator and it will work just like the new ones. It's a great idea to purchase the instruction booklet too, because vent tube/regulator do work a little differently then petcocks. Click here to find the parts that you are going to need to make the exchange and to order an instruction booklet. All American no longer manufactures Canners and Cookers with petcocks. more images of petcocks? click here. I have a vintage pressure pot that's missing the lid. Can I get a replacement? Sorry, most major pressure cooker and canner brands have changed styles many times throughout the last 100 years. They did not keep producing the lids or the kettle bottoms as the models were updated. Of course, you can use your pressure cooker/canner model number to find correct over pressure plug. 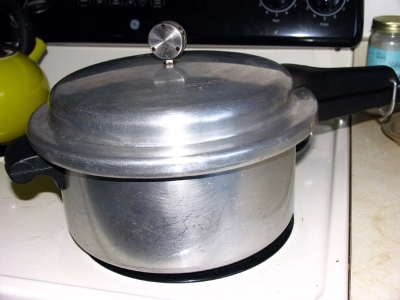 It may also be helpful to know that the over-pressure-plugs that fits your pressure cooker or canner is one of the three variations made and available to you. 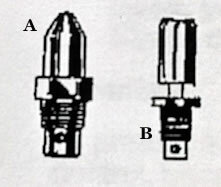 You can very easily determine if you need the metal safety fuse (below left). Simply inspect the lid's underside and if there is a hexagon or stop-sign-like plug that screws into the lid, you need the 9888 metal safety fuse. Safety fuse color may differ from original. The other options, rubber-only over pressure plugs, pop into the lid (below right). 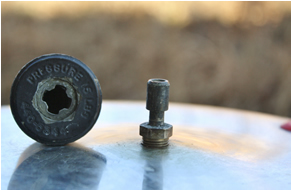 The rubber from your old pressure plug may have become hard should be removed and replaced. Pressure gaskets differ not only in diameter but also in thickness and rubber shape. Due to the volume of gaskets with the same diameter, varying by millimeters we're sorry we cannot properly fit gaskets from measurements. To order your replacement gasket, we'll need your model number. or the actual gasket that needs to be replaced. If you cannot see the model number, you can mail us your old gasket (or part) to our office in Virginia. What is the difference between gaskets 3440 and 9882? This is one example of how difficult proper gasket selection can be without searching by your pressure cooker or canner model number. The diameters of 3440 and 9882 are equal. The 3440 is about a millimeter thicker on the outside and has a differently shaped inside. Although both gaskets may fit into your lid, a gasket too small will leak around the sides while a gasket too big won't allow a lid to close. Thickness comparison of sealing rubber gasket 9882 (shown on the top) and rubber sealing ring gasket 3440 (bottom). If your cooker-specific model number page lists different parts than your model, those parts have likely been updated. Many older Mirro pressure canners and cookers were manufactured using vent tube B. Check out this mirro model number M-035 with the discontinued vent pipe and regulator. For some Mirro models (like the M-0536 pictured below) when replacing the old regulator ( the vent tube must also be replaced and vice versa. I live in BC, Canada. Is there a parts distributor in Canada? We ship to all locations in Canada. There should be a slight leakage under the pressure regulator when cooking is started, do not be alarmed. This is usually due to condensation formed because the temperature of the pressure regulator is lower than the rest of the cooker. This condensation will disappear as the cooking progresses. Another possibility is the vent tube is loose, in which case it can be tightened with a crescent wrench. Care should be taken not to not to nick the upper surface of the vent pipe. After considerable time, the vent pipe may become worn and should be replaced. When first beginning to cook it is normal for moisture to form on the cover and between the handles. Leakage between the cover and the body is typically due to shrinkage of the sealing ring after a prolonged period of use. If this condition develops, both the sealing ring and automatic air vent (on presto) should be replaced. Be sure the groove the sealing ring fits into is clean and free of all foreign matter. 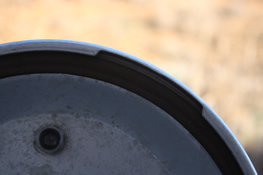 If the leakage persists after a new sealing ring is in place, it may mean the rim body or cover flange has been damaged. In this case, the complete cooker should be serviced. A slight amount of leakage around the automatic air vent is a normal operating condition . The automatic air vent acts as a valve and will completely seal the cooker. Continued leakage may mean that foreign matter has collected among the edges of the automatic air vent. This may be corrected by removing and washing the automatic air vent with hot soapy water. CAUTION: Whenever you see excessive leakage from the cooker, remove it from heat immediately. Reduce pressure completely. Remove pressure regulator from vent pipe.